Today we kick off a new series for Blogging Babies and the Bayou called: A Walk In the Park, State Park Spotlight. This 50 week series will take readers into a new state every week and feature local State Parks. I had my first camping experience through Girl Scouts in Los Angeles and moved to S.E Louisiana as a teen where camping was a family past-time. Over the years, my husband (and expert camper) and I have visited various campgrounds and state parks in Louisiana, Mississippi and Florida. My mission is to open the eyes of many readers and give a small glimpse of what your own state may offer. I hope you enjoy our: Walk in the Park. Alabama the Beautiful is a great place to start looking for camping, fishing, hiking, and other opportunities that involve getting back to nature. The state has many gorgeous facilities and lots of woodlands to visit. Here are just a few that may catch your attention. Located in rural Marengo County is Chickasaw State Park, a 520-acre roadside park that may be one of the smallest Alabama has to offer, but it’s also one of the easiest to access for many people. It boasts a wading pool, hiking trails, a barbeque grilling pavilion, modernized campsites and large pavilions and picnic areas. This park is perfect for reunions, parties, and other gatherings and is even handicapped accessible. In fact, it is one of the few handicapped-accessible, state-operated hunting facilities in the state of Alabama. If you are looking for a great place to stop while traveling, or if you want to experience some low-key camping, the Chickasaw State Park, located at 26955 U.S. Hwy. 43, Gallion, AL 36742. 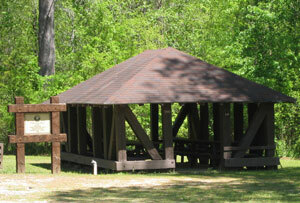 For more information on this park, contact the park office at 334-295-8230. Located along the banks of the Tennessee River in Alabama is Lake Guntersville State Park, which overlooks the 69,000-acre Guntersville Lake and has an additional 6,000 acres of natural woodlands. The park features an 18-hole championship golf course, a beach, a hotel with an outdoor pool, full-service restaurant, rental pavilions, ample parking, fishing center, hiking trails, nature programs, modern campgrounds, lake view cottages on the lake, and a beautiful resort lodge on Taylor Mountain and. All of this provides a selection of overnight accommodations, as well as daytime fun and events that are definitely beyond comparison of any other state park. But it doesn’t just stop there! 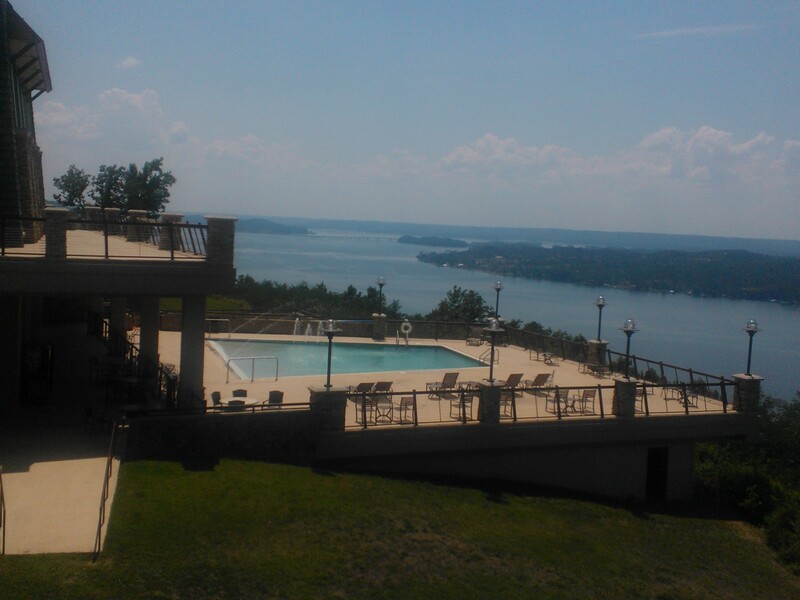 Lake Guntersville State Park provides gorgeous conference facilities large enough to accommodate up to 300 people and they offer wedding services, too. For more information on this one of a kind resort park, contact the main office at 256-505-6607, or visit them their main location at 1155 Lodge Drive, Guntersville, AL 35976 or their campgrounds at: 24 Campground Road, Guntersville, AL 35976. 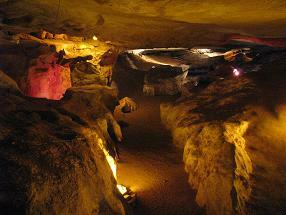 If you have ever wanted to go exploring caverns and caves here’s your chance! Rickwood caverns is a 260 million-year-old limestone formation that created caverns in Alabama with water during the Mississippian period. Inside, you will find blind cave fish in an underground pool, shell fragments and fossils of marine life that are visible along the cavern ceiling and walls, as well as other natural wonders and beauty in one stunning mile of living geology. Aside from the caverns, the park also features an Olympic-sized swimming pool, picnic area, hiking trails, playground, campground and gift shop. They also offer gemstone panning! Park entrance fee is $1 and annual passes are available. Under age 6 is free. If you’re looking for the largest state park in Alabama, you’ve found it! Oak Mountain State Park is set apart from the rest by boasting more than 50 miles of hiking, biking, and horse-riding trails along 9,940-acres of state park. 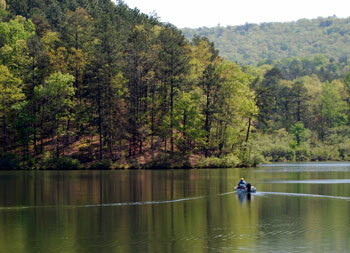 If you have a mixed group that enjoys different outdoor activities, Oak Mountain is the place for you. There is something for all to enjoy! The park also has picnic facilities, two fishing lakes, one recreational lake (that offers pedal boat and canoe rentals), a swimming area, a boat launch for your personal boat, large fields for sports playing, a 18 hole golf course with pro shop and driving range, mountain bike trails, and horseback riding facilities where you can rent a horse and equipment. If one day simply isn’t enough to enjoy all there is to do at Oak Mountain State Park (and it really won’t be), the park also offers cabins and camping facilities. But it doesn’t stop there! Oak Mountain also houses The Wildlife Center, which is the largest wildlife rehabilitation center in Alabama, caring for more than 2,000 injured and orphaned wild creatures yearly. Visitors can enjoy viewing the rehabilitation process and learning about native species. Day use fees are $3 for Adults, $1 for children 6 to 11 years of age and senior citizens 62 years of age and older. For more information, contact the park office at 205-620-2520. 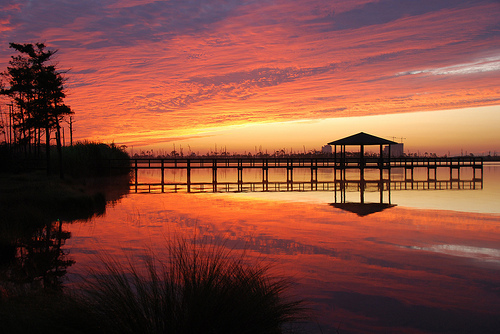 Alabama is known for its beautiful gulf scenery, so it’s only natural that you’d want to spend time in a gulf park. Gulf State Park is located in the city of Gulf Shores on the coast of Alabama and features sun-kissed beaches of magnificent beauty. The park sits on 6,150 acres, and two of those miles are nothing but white sand beaches. Gulf State Park has a campground, cabins and cottages for overnight stay, walking and hiking trails, and the largest fishing pier in the Gulf of Mexico. Have you visited Alabama recently? If so, what was your favorite city or town? Back when I had dogs I loved going to state parks for the day–however I am not a camper outer-give me a motel room with an indoor toilet and a soft bed and I am happy! Well these pictures make me long for warm weather and travel!! Very nice. I’ve never been to Alabama, I’d like to go at least once though. So pretty. In my area we have lots of state parks, but they are mostly walking/jogging trails and/or fields with maybe a lake for fishing or something. Those pictures are gorgeous! I have never been to Alabama but the pictures of water make me want to go. I live in the desert so dont have any lakes near by. We just have man made lakes. I love finding new state parks to visit! We are always going to the ones in our area. They are great for walking the dogs, fishing, and lazing on the beach! I have only been to Alabama for a wedding in Birmingham, but this post makes me want to get outside of the city and experience the natural treasures Alabama has to offer. I live in the Carolinas, so I’m not too terribly far from you! We have beautiful state parks here, as well, but it’s always fun to try them somewhere else. I adore visiting National Parks! But it can be so hard to see all the one’s I want to. This was really nice! I was telling my Hubs I wanted to go see a Bayou one of these days. As for the caves and caverns, both my hubs and I love exploring them. So much to learn. I would love to visit all of those parks, if I could. I love the outdoors, that is why I can’t wait until Summer gets here. Amazing photos and parks! The photo of Oak State Mountain Park is absolutely stunning! Thanks for sharing. I really would love to explore this area of the US. This looks like such a beautiful place! I’d love to visit state parks for a day. So pretty and nice to be outside. We used to visit Oak Mountain State Park regularly when my husband worked in Alabama. The kids loved it. This is one state I have not been to, would love to visit when the weather is good for camping. Those parks would be perfect for camping with my family – those views are amazing. Those views are a must see. I have not been to Alabama and it would be nice to visit even once. I love our state parks and hope to continue to introduce them to my kids as they grow older. Nice. I find some of the state parks to be a great place to take the family during the hot months. I’d love to travel with you! I hope I could do what your doing someday. Traveling really is fun! My first (and only) camping experience was the middle of June when I was 7 months pregnant – not a smart decision. I really need to give it another go when it is a tad bit cooler. My family goes every other year and I conveniently have to work each time. My youngest son asked to camp out in the backyard, so I guess he’s trying to get me back into the routine, too! These pictures make me want to visit them all what lovely places. I’ve never actually considered going to Alabama, but those are some beautiful places. I’d love to go see those caverns! Such beauty! If I am ever traveling through Alabama I’ll have to look into one of these spots! Our country has the most beautiful sights! That image of Lake Shelby Cabins is amazing. Traveling is so much fun! I wish to visit Alabama one day. I met a bunch of nice people from Alabama when I was in the service. Our state parks are such a natural treasure. They offer so much. I hope I get to visit some of the parks on this list. I hope to visit Alabama one day. It looks like a lot of fun. These state parks are beautiful. It has never occurred to me to visit a state park in Alabama, my neighboring state growing up. I’m originally from NW Florida or as it is affectionately known L.A. (Lower Alabama) Ha! All joking aside, I’m really looking forward to this series and if you ever need someone for Maryland, Washington DC, or Virginia let me know. I’d be happy to help. I’ve never been to Alabama before. Looks like such a beautiful place. Would love to visit there with the family one day! Those are some beautiful photos of the parks..If I’m ever in Alabama I’ll be sure to pay at least one of them a visit. I lived in Alabama for a couple years and lived visiting the state parks! Lake Guntersville is beautiful and Monte Santo was another favorite. When my son chose to attend college in Birmingham, I knew nothing about Alabama — except the stereotypes. Now that I’ve visited — a lot — the state, and Birmingham — have busted every single stereotype. Such a beautiful state! So much history. Now that we’ve experienced most of what Birmingham has to offer (lots) I look forward to venturing further out. Thanks for this review.